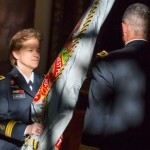 FORT DRUM, N.Y., August 19, 2015 — Army Col. Diana Holland, the 10th Mountain Division’s deputy commander for support, was promoted to brigadier general and became the first woman to serve as deputy commanding general in any Army light infantry division during a July 29 ceremony here. Holland, who has served in that position since her arrival here in May, is scheduled to deploy to Afghanistan this fall as the division’s deputy commanding general for support, in support of Operation Resolute Support. Holland previously deployed with the 3rd Infantry Division to Iraq in 2004 and led the 92nd Engineer Battalion and the 130th Engineer Brigade during deployments in Afghanistan. Because of her qualifications and previous assignments, Holland is well-equipped to be the DCG-S during the division headquarters’ upcoming deployment to Afghanistan, said Army Maj. Gen. Jeffrey L. Bannister, 10th Mountain Division and Fort Drum commander. “The missions we have during our next deployment are right along her DNA,” Bannister said during Holland’s promotion ceremony. Holland was among 895 second lieutenants who graduated from the U.S. Military Academy at West Point, N.Y., in 1990. It was the 10th class to graduate women and the first to have a female cadet serve as first captain, the highest leadership position in the Corp of Cadets. Approximately 2,000 of the 7,000 lieutenants who received their commission that year went on to reach the rank of colonel, and only 40 have been selected to become brigadier generals. After postponing her promotion ceremony so family and friends could attend, Holland began her remarks by making sure her audience could hear her, including the few in Fort Bragg, North Carolina, who watched the ceremony via teleconference. Many of her friends and colleagues traveled to attend the ceremony, during which she thanked all for their support. Holland also gave special recognition of the noncommissioned officers with whom she has worked throughout her career, recalling the names of every enlisted soldier who was part of her command teams: her platoon sergeant when she was a platoon leader, her first sergeant when she was a company commander, and her command sergeants major as a battalion and brigade commander. Serving with soldiers “is a privilege, and I am forever grateful for the opportunity to serve alongside such great Americans,” Holland said. 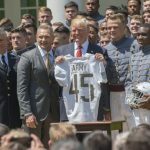 “It is no wonder that we are, and continue to be, the greatest army in the world,” she said. Previously, 18 of the Army’s 308 generals were women. Now Holland has joined their ranks.